Key Concept: Explains the concept of equal and the = sign. 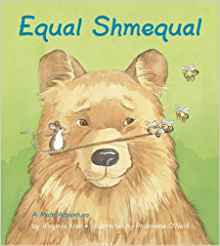 Description from the publisher: What does it mean to be equal? Mouse and her friends want to play tug-of-war but they can’t figure out how to make teams that are equal. Nothing works until Mouse starts thinking mathematically. Wonderful illustrations capture Mouse and her animal friends from whiskers to tails.